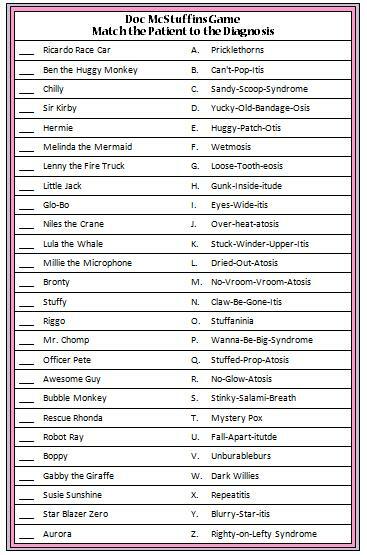 This fun Doc McStuffins game lists some of her patients along with their diagnosis. The goal of the game is to match each patient with the diagnosis he or she received from Doc. I absolutely love the fun names of each diagnosis! There are a lot here so it may be a bit tricky – I’d love to hear how you do – let us know in the comments below. If you love Doc McStuffins, don’t forget to check out our special Doc McStuffins category for even more fun ideas! Click here for the free printable Doc McStuffins Game. The second page has the answers but here they are again for a quick reference. How many of these episodes do you remember? My apologies to Doc if I haven’t used the correct spelling with each diagnosis. You can find more Doc McStuffins games and colouring pages on DisneyJunior.ca. Who has been your favorite Doc McStuffins character? Mine is Awesome Guy! To stay updated on the latest fun ideas and free printable games, we’d love to have you join our communities on Facebook, Pinterest and Twitter. We have a combined community of over 22,700 members and we’re growing daily! Be sure to say HI so we can properly welcome you to the group. See you there! I’ve never heard of Doc McStuffins. We must not get it in our satellite package. Looks like a fun game. I have never heard of this but it’s pretty cool and looks like something fun and interactive for kids to enjoy while having playtime. Love how cute that show is. All Disney junior shows are adorable. Now I’m trying to figure out how we’re going to get out of ordering Disney Jr channel lol!